On Google Earth, the HWH shop appears to be in a corn field in the middle of nowhere Iowa (ok the corn is not yet planted on the Google Earth picture, but believe me it sprouted up all around that shop). If you look past the corn though there is cool stuff tucked away all around so while our leveling system was put in a freezer for the winter simulation required to get it to “break,” we took the Prius on a road trip. First stop, the Truck Museum at the Iowa 80 Truck Stop which we arrived too late to visit on Sunday. The museum is free and full of restored and soon to be restored vintage trucks. Even I enjoy it though I will have to admit that I spend a lot of time playing with my camera trying to learn more photographer stuff than I do admiring the cylinder heads and suspensions. After Storm has his fill of trucks, it is time to let him peruse tractors. The John Deere Tractor Pavilion in nearby downtown Moline, Illinois seems to be just that he needs. 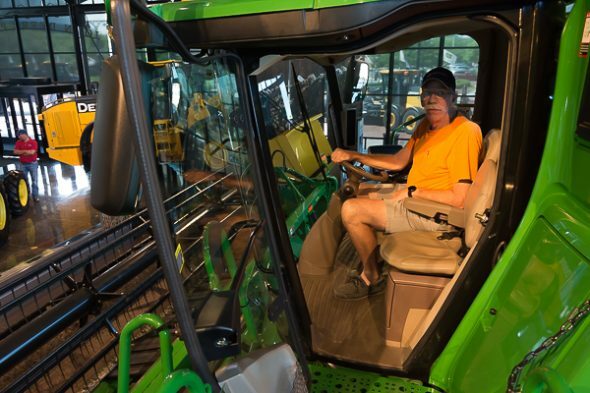 A short 20 minute drive up the interstate and across the Mississippi has Storm behind the wheel of a giant combine studying the controls in hopes he can get her started up! A special thanks to my Rex Wellness friends who chipped in for a going away gift for me. I used it to purchase a hot new camera lens that allows me to take photos in low light without a flash. Still trying to learn how to get good at it, but I used that new lens to practice on this museum excursion. Miss you guys and THANK YOU! Just the tip of the iceberg in Moline and the Quad cities, I will share more tomorrow. At this point the question is more what is NOT wrong with the RV. I will share more details in a post later, but right now we think we are getting ahead of it and will hopefully be in Oshkosh as scheduled if all goes well tomorrow. Thanks for the blessings as we need all we can get especially this week. Again NOT complaining as in spite of our setbacks according to everyone else we talk to with an RV we have gotten off lightly (and actually pretty cheaply) so far. You guys have a safe trip and a good time getting out here – looking forward to hugging you both soon!! What are the particulars on the new lens? Sounds like something I might be interested in. The lens is a AF Nikkor 50mm f/1.8D. I got it to shoot portraits with because it will allow such a shallow depth of field. I haven’t had a chance to practice that yet as Storm just won’t stay still and pose 🙂 It does work great in low light especially if I bump up the ISO just a bit. Make sure Charlie knows I’m super envious. About the truck and tractor museums, not the RV problems. I could have spent half a day in that combine cab alone. OMG – he did not want to get out of it either. You should definitely plan to go through this area on I-80 sometime on a trip out this way. LOTS of things you would enjoy along that route. Wish you had been on the hydroelectric tour in Yankton. The plant supervisor was a retired Navy Submariner. He was more than happy to go into intricate detail about how the plant operates. I thought Charlie was going to stay there all day and I think you would have liked him too. If you ever find yourself in the Detroit area, take Charlie to the Henry Ford Museum in Dearborn. When it comes to things mechanical, it rivals the Smithsonian in quality and quantity. And while he spends the week there looking at manly things, you can slip next door to Greenfield Village which is like stepping back in time. That sounds like a great plan to me. We will add that to the “bucket” List!